The same elements that make games enjoyable also make them ideal learning environments. Gaming is especially useful for simulating real-world career scenarios and training students how to respond. 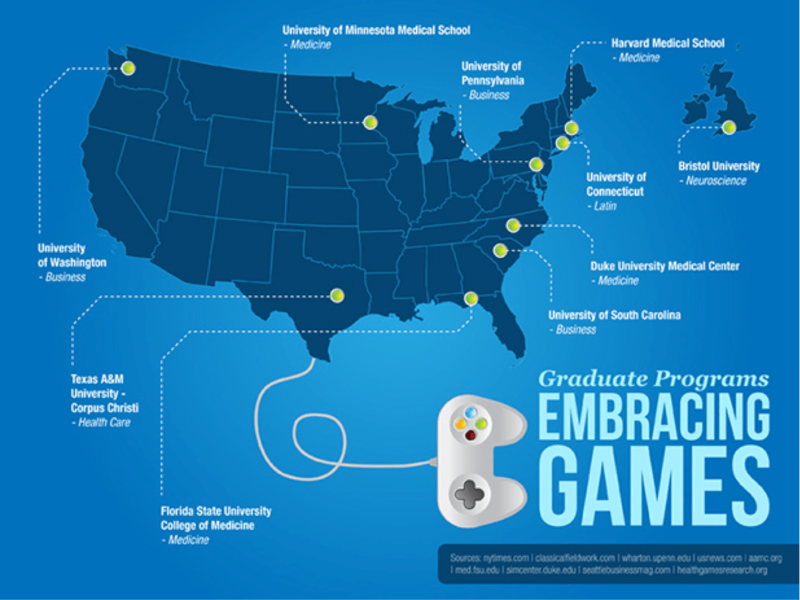 Several prestigious institutions now incorporate gaming into their graduate programs. “Keep sitting there staring at that screen. Atari will rot your brain as fast as Fun Dip rots your teeth.” This may have been a parental warning back in 1985, but things sure have changed since then. Today, universities are discovering that the same elements that make games so mesmerizing also make them ideal learning environments. When we’re engaged with games, our minds are assembling information, recognizing problems, and working towards solutions. Games are an effective platform for simulating real-world scenarios and training students to react wisely under pressure. That’s why gaming is catching on at the undergraduate and graduate levels, even at top academic institutions. Texas A&M University, Corpus Christi: In a game called Pulse! !, students can guide a 3D avatar through the medical setting to practice some of the most critical patient care skill. University of South Carolina, Moore School of Business: Students at the University of South Carolina use marketing and operations simulations through their MBA courses. Florida State University College of Medicine: Geriatrics students play ElderQuest, and nurse the Gray Sage, a wizard with a number of health issues, back to his full power. University of Connecticut: Graduate student Karen Zook, with the help of Roger Travis, is bringing Latin back to life through a game called Operation Lapis. Bristol University: Paul Howard-Jones, a professor of neuroscience has developed his own “TWIG” (Teaching With Immersive Gaming) method. Harvard Medical School: Dr. Bryan Bergeron, a researcher in Health Science and Technology, has developed several health care-related games that are used by Harvard’s students and other medical schools across the country. University of Pennsylvania, Wharton School of Business: Wharton’s Alfred West Jr. Learning Lab has fostered the development of more than 30 games for supplementing business education courses for MBA students at the school. University of Minnesota Medical School: Researchers noted the positive effects of a video trivia game on the psychopharmacology knowledge of 29 third-year medical students. ← xMOOC or Publishing Paradigm?